The EU negotiates various trade deals all over the world, but they depend on approval by the European Parliament. Read our overview of the negotiations in progress. On 13 February, MEPs voted in favour of EU-Singapore trade and investment protection deals, which will eliminate nearly all tariffs within five years. This comes only two months after MEPs approved a major trade agreement and a strategic partnership with Japan. 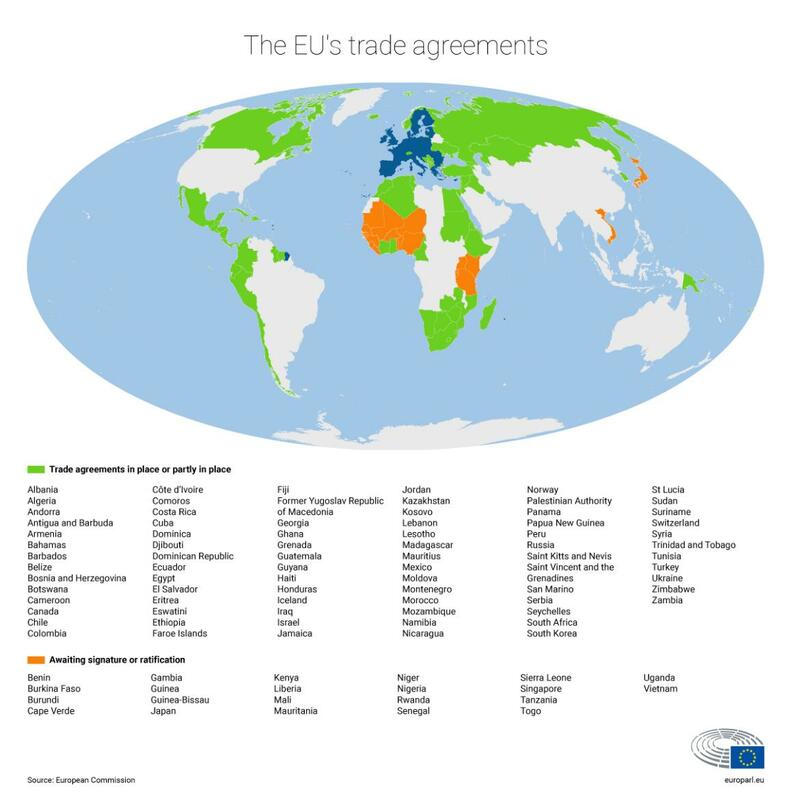 Trade agreements are very important to the EU as they are a key driver of economic growth. In 2015 the EU was the world's biggest exporter and importer of goods and services, covering 32.15% of the global trade, ahead of the US (12.01%) and China (10.68%). New trade agreements create new business opportunities for European companies, leading to more jobs being created, while consumers can look forward to more choice and lower prices. There are concerns that trade agreements can lead to job losses in some sectors due to the increased competition, but these deals always create more jobs than they destroy. Another concern is that they could lead to high quality standards for products such as food being watered down. However, as the EU represents such a large market, it is in a good position to impose its standards on foreign companies. For MEPs, quality standards are always a red line in trade agreements and any attempt to lower them could be a reason for them to reject them. In addition EU negotiators often include clauses regarding human rights and labour rights in trade agreements to help improve the situation in the country we are trading with. Read more about globalisation: how the European Parliament is making it work. The EU has different types of agreements in place with countries. They can focus on reducing or eliminating tariff barriers or establishing a customs union by removing customs duties and establishing a joint customs tariff for foreign imports. It’s not all about tariffs though. It could also be about investment and how to deal with disputes involving investment. For example, when a company feels a decision by a government is affecting its investment in that country. Non-tariff barriers are also vital such as product standards (for example the EU has banned certain hormones in cattle farming over health fears). The free trade agreement with Canada, known as the Comprehensive Economic Trade Agreement (Ceta) provisionally entered into force on 21 September 2017. It will enter fully into force once all EU countries have ratified the agreement. The Transatlantic Trade and Investment Partnership (TTIP) with the United States has proved very controversial due to concerns over product standards and the resolution of investment disputes. Negotiations were stopped until further notice at the end of 2016. MEPs adopted a trade agreement with Japan during the December plenary. There are no free trade negotiations ongoing with China, but there are other talks as well such as negotiations for a comprehensive EU-China investment agreement. Launched in November 2013 and the latest negotiation round took place on 29-30 October 2018. Negotiations for a comprehensive trade agreement with Australia were launched on 18 June 2018. Negotiations for a deal with New Zealand were launched on 21 June 2018. In both cases there have been further rounds of talks since then. In Latin America the latest round of talks with Mercosur countries took place on 10-14 September 2018. The date for the next round still has to be confirmed. Negotiations with Mexico on modernising the EU-Mexico Global Agreement started in June 2016. A political agreement was found on 21 April 2018 and the full legal text is expected to be finalised by the end of the year. The latest round of negotiations with Chile took place in May 2018 and the date for the next one still has to be determined. There are various agreements, including association agreements to especially boost trade in goods. There are also talks on expanding these agreements in areas such as agriculture and industrial standards with individual countries. 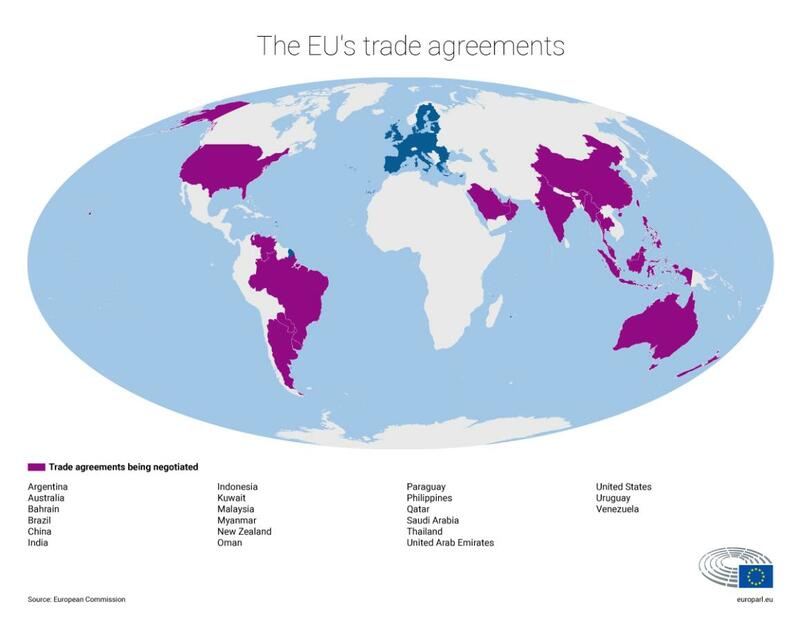 The Trade in Services Agreement (TiSA), is currently being negotiated by 23 members of the World Trade Organisation (WTO), including the EU. Together, the participating countries account for 70% of world trade in services. Talks were put on hold in late autumn 2016 and the next steps still need to be determined. Since the Lisbon Treaty entered into force in 2009, trade agreements need the Parliament’s approval before they can enter into force. MEPs also need to be regularly updated on progress during negotiations. Parliament has already shown it will not hesitate to use its veto if there are serious concerns. For example MEPs rejected the Anti-Counterfeiting Trade Agreement (Acta) in 2012. Check out our infographic on the EU's position in word trade. This article was originally published on 19 October 2016, but updated on 13 February 2019 to include the vote on the Singapore agreement. Trade wars: what are the EU's trade defence instruments? Globalisation offers opportunities as well as challenges. Find out how the EU tries to optimise the benefits while reducing the risks. The EU can resort to a slew of measures to protect itself against unfair trade practices, from appealing to the WTO to full-out trade war.